To wrap up the series we comment on comparable growth trends in each marketplace and give our thoughts on outlook of HSAs. Reason 3: HSAs are still new (to many). While they have been around for 14 years, many Americans still hadn’t heard of HSAs until their recent prominence in proposed healthcare legislation. As a result, the HSA marketplace has not yet enjoyed the economies of scale of the more established 401(k) and 529 plans. However, the number of HSA accounts has grown dramatically since their inception in 2004 to just over 21 million as of June 30th, 2017. For perspective, 401(k)s had roughly 19 million accounts in their 14th year1. 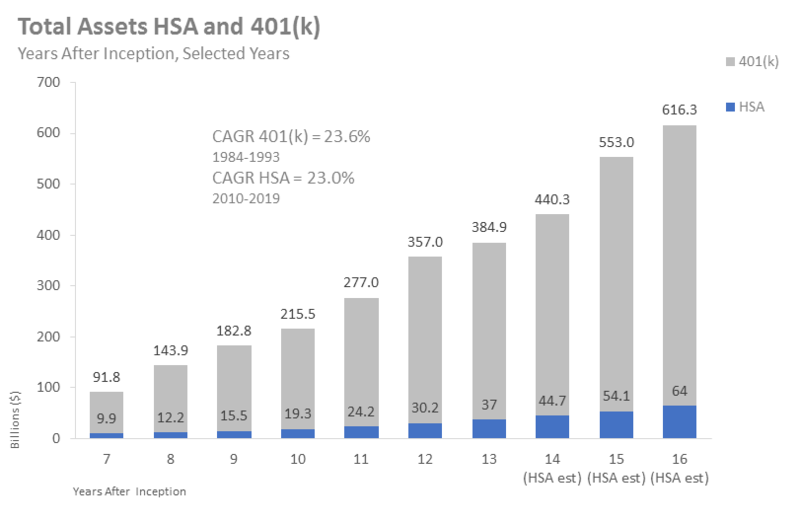 The rapid adoption of HSA plans seems to be on a similar path to 401(k)s, in terms of the number of accounts if not yet assets. At their respective 14-year marks, 401(k) assets were roughly 10 times higher than 2017 estimated HSA assets2. This may be largely due to the insurance required for HSAs as participants may be less inclined to contribute after they have reached their annual deductible. A 401(k) owner may plan to receive Social Security or a pension as supplemental income during retirement however, it only slightly reduces contributions. While total assets are much lower in HSAs, account growth measured by the compound annual growth rate (“CAGR”) is expected to be nearly identical over the selected years above. This is especially noteworthy given the fact that average HSA balances have been stagnant over the past few years. We plan to expand on HSA balances in the near future, however within the scope of this column a couple of narratives stand out: As noted in part 1 currently an estimated 64% of HSA accounts are used as spending vehicles, resulting in annual carry-forward that is often less than 30% of total contributions. Additionally, annual HSA contribution limits are far lower than 401(k)s ($3,400 for HSAs and $18,000 for 401(k)s in 2017). These and other factors justify modest HSA balances compared to 401(k)s.
Low balances may cause providers to place less emphasis on HSA investing, leaving somewhat of an educational gap for participants. As a result, HSA offerings may not provide the educational tools, resources, and general functionality that simplify the investing process and enhance user experience. These resources should be a focal point in a robust investment solution as they help investors make informed decisions while investing in their HSA. As part of our commitment to shedding light on the HSA market and educating investors we will release a topic paper further comparing investing in Health Savings Accounts and 401(k)s. HSAs warrant the comparison as their persistent adoption could represent the second leg of the shift to consumer directed benefits, which saw 401(k) assets balloon to where they are today (see Investment Company Institute’s most recent retirement market summary). And while employers rethink their benefit plan design, consumers must equip themselves with the tools to make the most of their health and retirement decisions. 1 Form 5500 filings with the U.S. Department of Labor, Table E20. “Number of 401(k) Type Plans, Active Participants, Assets, Contributions, and Benefits: 1984-2012”. 2 2017 Midyear Devenir HSA Research Report, Investment Company Institute. 2017. “The US Retirement Market, Second Quarter 2017” (September). Investment Company Institute. 2017. “The US Retirement Market, Second Quarter 2017” (September). Sage businessresearcher, 2015. “401(k) Assets 1984-2012 ($US Trillions)” (March).